How to travel cheap in Europe: Quit Your job and start your adventure. You want to quit your job and travel around Europe. You don’t know how to plan your trip. You want hacks for cheap travel. If you are not inspired to travel in the first 30 minutes of reading, I’ll refund your money. It doesn’t matter your age. As long as you can carry your backpack, you can travel. 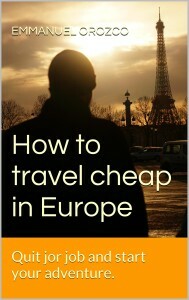 Most of the books will give you tips for cheap travel or improving your wellness. I will help you discover that to improve your wellness, you need to travel, And you can do it cheaply. Start your adventure around the world. 1.2 What if I am crazy? 1.3 The best age to travel. 2.1 The one way ticket. 2.3 Do you need a visa? 2.4.1 I should hate Barcelona. 3.4.1 Inside of the city. 3.4.2 Outside of the city. 3.5.2 The Burger King trick. 4.2 Where to go now. 4.3 Let’s keep in touch.